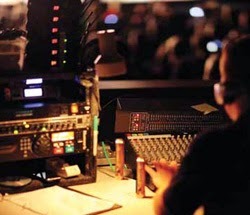 These days more of us sound techs are being asked to record live performances in addition to mixing the live concert sound for the show or event. Many options are available today to help with the process of recording live. I found a great article on Prosoundweb.com by Craig Leerman called "Ample Options: The Universe Of Live Recording. Mr.Leerman discusses a number options for recording gear and the techniques that will allow you to produce a decent quality live sound recording for your shows and events. 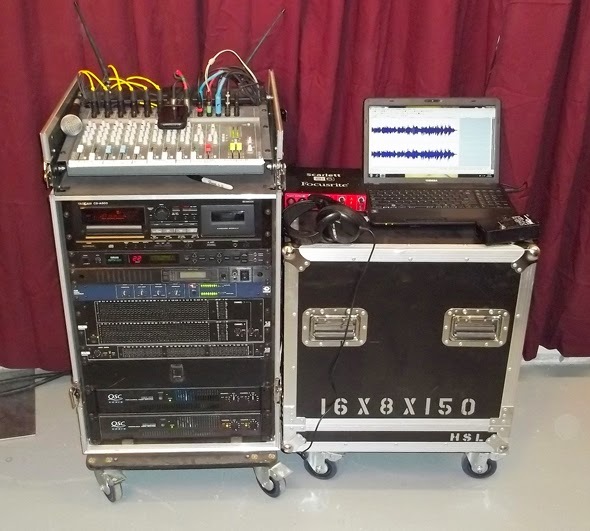 The author showcases his own live recording rig that he uses for conference events. A beautiful rolling rack system with an A/D converter feeding a laptop computer for live recording. (Picture below). Personally, I have only recorded a few times on certain shows. One time I used a Yamaha MD8 digital MiniDisc recorder to record a live band playing country music for a gig. Here is a picture of the rig I used for that show. (Picture below). Back in my House Tech Theatre days, I used to get to do basic 2-track recordings using a shotgun microphone permanently mounted in the theatre, patched into the control room, then routed through the house mixing console and recorded to a DAT Recorder. When the show was over, the client would come and collect the DAT and pay me the money for it. It worked great because, the performer got the original tape and I received the money to buy more blank tapes for the venue. At that time, the theatre sound gear used for recording was an EV shotgun microphone, a Soundcraft DLX mixing console, and a Tascam DA-30 DAT Recorder. How the recording technology has changed so much! Labels: live recording options, Prosoundweb.com, Tascam DA-30 DAT Recorder, Yamaha MD8 digital multitrack recorder.